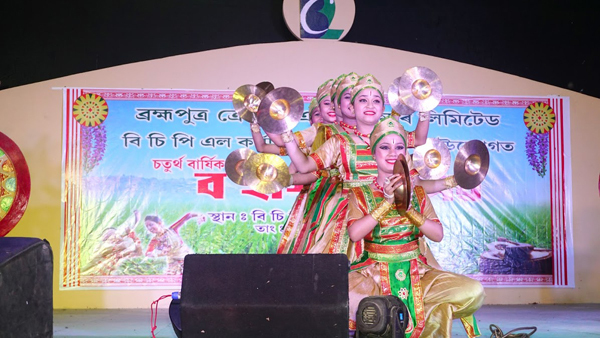 Brahmaputra Cracker and Polymer Limited (BCPL) in association with the BCPL Staff Welfare Committee (SWC) organized a one day Bohagi Utsav at BCPL Township on Thursday. The Bihu Utsav showcased the pristine Assamese culture with the amalgamation of music and dance from various parts of Assam. The opening ceremony began with the hoisting of the flag by AK Singh, Managing Director, BCPL. A Husori was performed by a group from Dewanbari village, situated near the BCPL Lepetkata complex. Unlike every year, this year SWC organized the Bohagi Utsav with various programmes representing the culture of Assam. In the evening the programme commenced with the lighting of lamp by Chief Guest AK Singh, Managing Director, BCPL and other senior officials of the company including OP Tailor, Director Finance and P Nagesh Chief Operating Officer, BCPL. The Brahmaputra Chambers of Choir, an in-house initiative of BCPL, presented a composite chorus of Borgeet, Holi Geet, Lukogeet,Jikir, Goalporia , Bongeet and Bihu. Prior to this celebration SWC also organized a week long Bihu Dance Workshop to encourage the ladies and children of BCPL township. This workshop not only boosted the morale of the kids but also gave them the confidence to perform on stage in the cultural programme. Other performances included Bhortaal Nritya by Nrityangan Kala Kendra , husori , jhumur by artists of Barbaruah tea estate. Inmates of Prerona Pratibandhi, an NGO from Dibrugarh District associated with specially-abled persons were also part of this Bohagi Utsav. They mesmerized the audience with their varied renditions and reminded all of us that with perseverance and will power anything is possible. As a part of cultural programme “News and Comics” group from Dibrugarh also showcased its talent before the audience. Singer Mrinal Mon Baruah and his group also enthralled the audience with his melodious voice. This initiative by SWC and Bihu Udjapan Committee was appreciated by one and all.